There are a lot of misconceptions about duplicate content and how it is handled by search engines. In simple words, duplicate content is, quite simply, content that appears online on more than one website or URL. This means you can have duplicate content on your own site, but we will get to that later. There is also no severe penalty for having duplicate content, but that doesn’t mean it is not an issue that needs to be addressed. There are still a lot of problems caused by duplicate content. In some cases, those problems severely limit your site’s SEO performance and visibility. As a way to address duplicate content, you can do a thorough duplicate content check and take steps based on the findings. What is a duplicate content check? Why is it so important to your SEO efforts? We are going to answer these questions in this article. Before we dig deeper into how to best check for duplicate content – and how to deal with it – it is worth taking the time to better understand duplicate content and how it affects your site’s SEO performance. As mentioned before, duplicate content can happen under different circumstances. First of all, you can have duplicate content on your own site. When you have different versions of a product and you separate them into different pages that have the same product description, you are actually creating duplicate content. The same can be said for when you have a print version of your page using a different URL than the original page. Another common occurrence of duplicate content is a site that has both HTTP and HTTPS as well as WWW and non-WWW versions accessible. More importantly, these versions are all crawlable and search engines pick up on them regularly. This too will lead to your site facing duplicate content issues with search engines. Lastly, there is content that actually gets duplicated. It is not uncommon for blogs and other websites to scrape content from various sources. When they copy content from your site and paste it to theirs, you immediately have duplicate content resting on other websites. Scrapers do this all the time and there is quite a lot of duplicate content out there. What Are the Problems Caused by Duplicate Content? Google remains somewhat vague when it comes to duplicate content, but one thing is clear – they don’t penalize websites that display duplicate content. Unfortunately, this means both the original site and the site that copies your content aren’t getting penalized. The lack of penalty doesn’t mean duplicate content isn’t an issue. 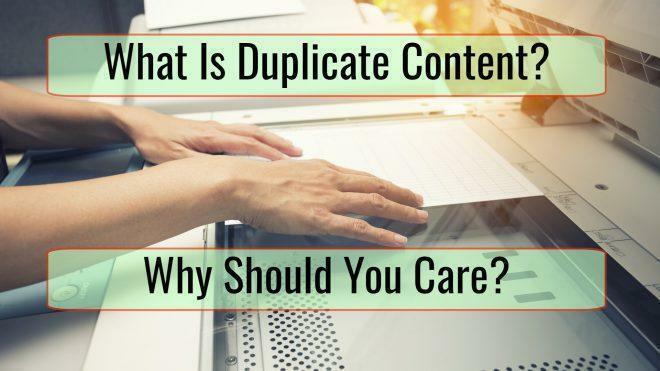 From a search engines’ point of view, duplicate content makes it harder for them to rank content and pages in a relevant, credible, and useful way. Let’s say you made a great article that users really love, and that article gets republished by a site with more traffic or domain authority. When the user searches for the topic of the article, which site do you think will rank higher? Exactly. In the eyes of search engine crawlers, publication date isn’t a priority metric. Instead, metrics such as user experience, domain authority, and relevance are considered to be more important. As a result, many duplicates essentially rank higher than the original. Search engines also don’t show versions of the same content, which is a problem on its own for websites that display a lot of duplicate content. When you have multiple pages for the same product, Google will only display one variation and simply hide the others. There is good news in all of this; checking for duplicate content is easier than you think. The simplest way to do it is by running a unique phrase from your content in quotes using Google and other search engines. For instance, you can search for “a phrase in your article” to see if other websites are copying your content. The only thing to keep in mind is the number of words you search. To get the best results, you want to keep the phrase to no longer than 10 words. Another great way to protect your site against duplicate content is by using services like Copyscape. Copyscape has a lot of handy tools that you can use to find and better understand duplicate content. For starters, it has a simple copy-paste tool that allows you to search for duplicates by pasting your offline content to the tool. There are monitoring tools too, including an API that will automatically perform the checks as a part of a more complex routine. When set up correctly, you can get notified every time your content is duplicated. As an added feature, you can also use Copyscape to deal with cases of plagiarism. When you find scraper websites that bluntly duplicate your content, for example, you can choose to file a DMCA claim immediately. Dealing with on-site duplicate content is easier than dealing with it off-site. In the case of on-site duplicate content – such as the aforementioned product variations – all you need to do is restructure your website to better deliver your key content.